Eilat is Israel's ultimate Sea and Sun City. It is a main tourist destination thanks to its beaches, coral reef, nightlife and desert landscape. 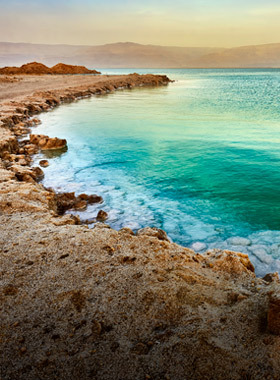 Located in the southern tip of the country, Eilat enjoys yearlong warm weather (It almost never rains!). Eilat also attracts divers from around the world that come to explore its famous coral reef. Skin and Scuba Diving is possible in many of the beaches, where you can find plenty of diving clubs and schools that offer diving equipment for rent. You can arrive in Eilat by bus from main cities in Israel, or by flight from Tel Aviv. The Negev desert in the South of Israel covers more than half of Israel's land area. If you come from the city, you will be especially struck by the stunning landscape of the desert. One of the most visited sites in the Negev desert is the Masada fortress, built by King Herod. According to the legendary tale Masada is where Jewish rebels chose to commit a mass suicide rather than surrender to the Romans. The Negev offers many attractions for its visitors such as hiking, camel riding, floating in the Dead Sea, experiencing Bedouin hospitality and much more! Be'er Sheva, the capital of the Negev region is an oasis in the desert. Be'er sheva is the home of Ben Gurion University and is known as a lively Student City. In Be'er Sheva you will find a combination of old and new. In the old city you will find Abraham's Well and interesting remnants of the old Turkish town, which the Ottomans built during their rule over the land. In the new part of the city there are different cultural institutions, cafés restaurants, pubs and clubs. One of the most famous attractions in Be'er Sheva is the Bedouin market, a weekly occasion that takes place on Thursdays in which Bedouins from the neighboring villages come and sell authentic Bedouin wares. Israel’s largest cities, Tel Aviv and Jerusalem, are easily accessible from Beer-Sheva by bus and train. Jerusalem, Israel's capital city, is a city unlike any other. It combines the old historical city with a vibrant modern city. It is home to many different religious communities and each practices its faith freely. Holy to Christians, Muslims and Jews, Jerusalem promises a unique spiritual experience. But Jerusalem is not only known for its religious significance. Jerusalem is also the home of artistic and cultural events that take place all year round. All Jerusalem visitors are amazed by the culinary scene in the city. The many immigrants who migrated to Jerusalem from North Africa, the Mediterranean and other Middle Eastern countries each brought their family recipes and together created a creative conglomeration of cuisines. While you're in the city make sure to visit the Machne Yehuda shuk (Market), and have a taste of all that Jerusalem has to offer. Rehovot is known as 'The City of Science and Culture'. It is the home of one of Israel's leading research institutions, 'The Weizmann Institute of Science', as well as one of the Hebrew University campuses. Thanks to those institutions Rehovot attracts many students and researchers who together create a young academic atmosphere. Rehovot is one of Israel's big and modern cities, and therefore you can find here a big shopping center, cafes, cinemas and a theater. The city also hosts many cultural events. The city is located south of Tel- Aviv and by train you can get from Rehovot to Tel Aviv in 20 minutes. Rehovot enjoys convenient public transportation and by bus and train you can get to almost any place in the country. Tel Aviv, Israel's second largest city, is one of Israel's greatest attractions. This modern and vibrant city is known as "The City that Never Stops", and indeed you will discover that the nightlife scene is on around the clock. 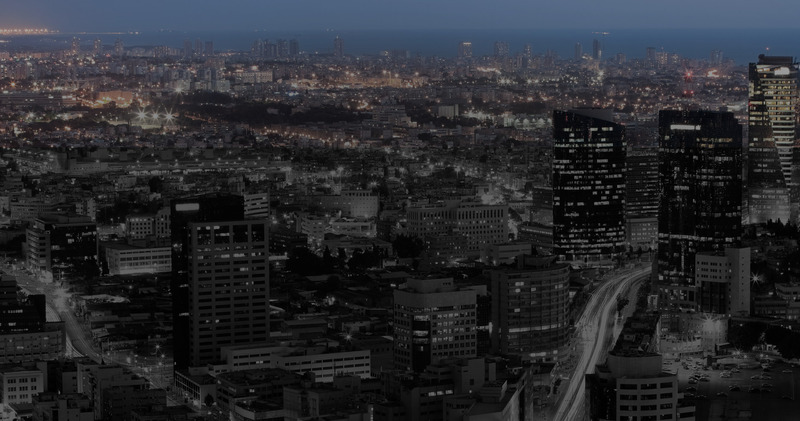 Tel Aviv is famous for its beautiful coast line, cafes and restaurants, and high-tech start-up atmosphere. It is also famous for its unique architecture - in 2003 Tel Aviv was declared a Cultural UNESCO World Heritage Site - for its many "Bauhaus" style buildings. Tel Aviv is a young and diverse city, where students of all kinds can feel at home and welcome. Herzliya is a central city 12K north of Tel Aviv. It is located on the Mediterranean coastline. The city is known for its large concentration of high tech companies. Herzliya's beach front is very popular among Israelis and tourists. There you can find many restaurants, hotels and beaches with swimming areas. In Herzliya you will also find attractive malls and shopping centers. The main train line from Tel Aviv to the North goes through Herzliya making it easy to get to Tel Aviv and other main cities as well. Netanya is a lively city located on the Mediterranean coastline. It is the capitol of the Sharon district. Natanya is known for its beautiful beaches and promenades. The city offers plenty of entertainment and culture centers, cafes, restaurants, shopping centers and art galleries as well as different events and festivals that are held year-round. Netanya enjoys very convenient public transportation. By train and bus you can get to almost any place in the country in a relatively short time. Haifa is the third largest city in Israel. It is located in the north of Israel upon the Carmel Mountain, overlooking the Mediterranean Sea. Haifa is known as a city of coexistence, where Jews and Arabs live together peacefully. Two of Israel's universities are located in Haifa; the Haifa University and the Technion. Thanks to those institutions Haifa attracts many students and researchers who together create a young academic atmosphere. 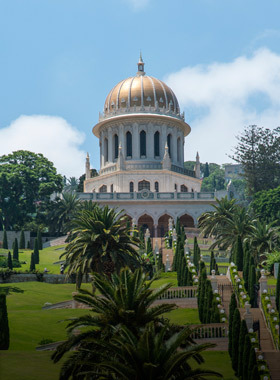 Haifa is famous for its beautiful Baha'i Gardens - a UNESCO World Heritage site. These gardens were designed and inspired by the doctrines of the Bahai faith. Haifa is home to many festivals year round, such as the Haifa annual film festival and the Haifa International Children’s Theater Festival. The Galilee is Israel's northern region, often referred to as "The Israeli Tuscany". The Galilee is home to some of Israel's most beautiful landscapes and historical and archeological sites. One of the most famous sites is the Sea of Galilee, where according to the New Testament Jesus walked on water. In the Galilee you can also find many Kibbutzim - collective communities founded before the establishment of the state by young pioneers, who strived to create an ideal community with a socialist agenda. Archeological sites with beautiful mosaics and ancient buildings from different periods can be found in many places in the region. The large concentration of sites and natural beauty are what make the Galilee so unique and special, and a common destination for getaway vacations. 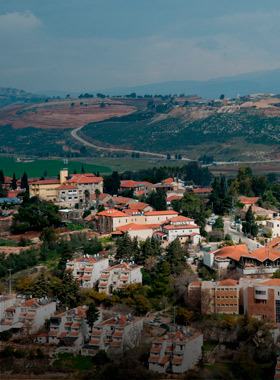 Kiryat Shmona is Israel's most northern city situated in the Upper Galilee. It is a small city, known for the beautiful national parks surrounding it. Kiryat shmona is the closest city to the Hermon Mountain, the highest mountain in Israel and the only place in Israel were skiing is possible during the winter. The city is located near the Hula valley, an agricultural region which is a main stopover for birds' migration between Asia, Europe and Africa. Thousands of birds stop at the Hula Valley during the winter and visitors can tour the park by bicycles and safari wagons to observe the unique birds in their natural habitats. Walking distance from the city is the Tel Hai College, which many of its students live in Kiryat Shmona, creating an active student city with a great young, vibrant and relaxed atmosphere. A Kibbutz is a collective community based on socialist principles. Most kibbutzim today operate in a range of different industries. This unique way of living started in Israel at the beginning of the 20th century. While you're in Israel don't miss the opportunity to go on a tour or volunteer in a kibbutz! 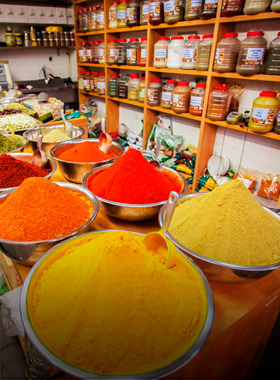 A visit in one of Israel's "Shuks" (markets) is one of the best ways to experience the Israeli- Middle Eastern vibe. Get ready for a blast of colors, smells, sounds and tastes, which together create an exciting experience you will never forget! 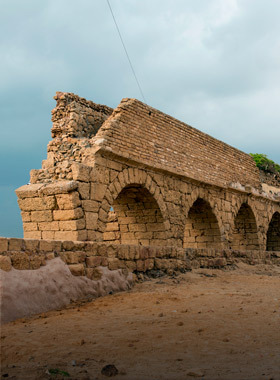 Caesarea was originally built in 31 BCE as a port city by Herod the Great on the Mediterranean coastline. The site is known for its famous and beautiful archeological findings, which include a Port, Herod's Palace and an amphitheater. The Lowest spot on the face of earth, beautiful scenery and a natural spa - the Dead Sea is a place you wouldn't want to miss. It's located 400 meters below sea level, and has the highest concentration of salt on earth. While in the Dead Sea you'll see people covered in mud - try it yourself and you will definitely feel its healing effects! 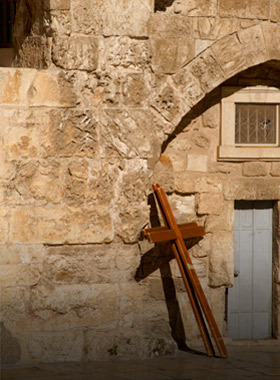 Via Dolorosa means 'The way of suffering' and is believed to be the path that Jesus walked on the way to his crucifixion. The 600 meter route is marked by nine stations and is a celebrated place for Christian pilgrimage. The Baha'i Gardens unique design and combination of geometrical shapes leave an impression on all visitors. In the gardens located in the City of Haifa, you will find a staircase of nine terraces. The staircase leads to the resting place of Prophet of the Baha'i Faith. 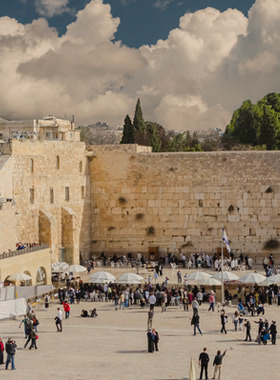 Located in the old city of Jerusalem, The Western wall is one of the most significant sites to the Jewish People. It is the only remnant of the holly temple. It is customary that visitors leave notes with wishes and prayers in the cracks of the wall. Life's a Beach in Israel! Hanging around at the beach is definitely the Israeli thing to do. 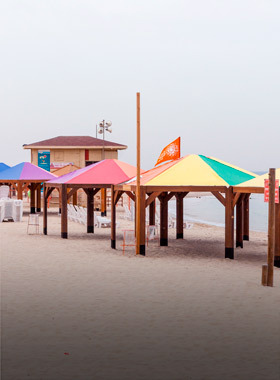 The warm weather that Israel is known for makes the beach a 4-season location. While studying in Israel you will definitely find yourself sunning at the beach eventually.